My latest chat is with Ron Houston of Dalton, Georgia, is a retired nurse as well as theatre enthusiast. He will also be featured in August copy of For Women Only Magazine in Dalton. He has been acting and volunteering with Dalton Little Theatre since 2002. He admits he probably would never have acted if not for the encouragement of his late wife Carol. They were married eighteen years. 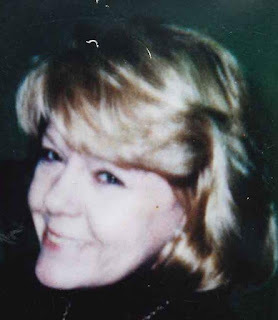 He decided to create the Carol Braden Houston Memorial Scholarship Fund in honor of her and her work. Carol was the founding director of Dalton's Infant Pre-school Council, which was created back in 1985. 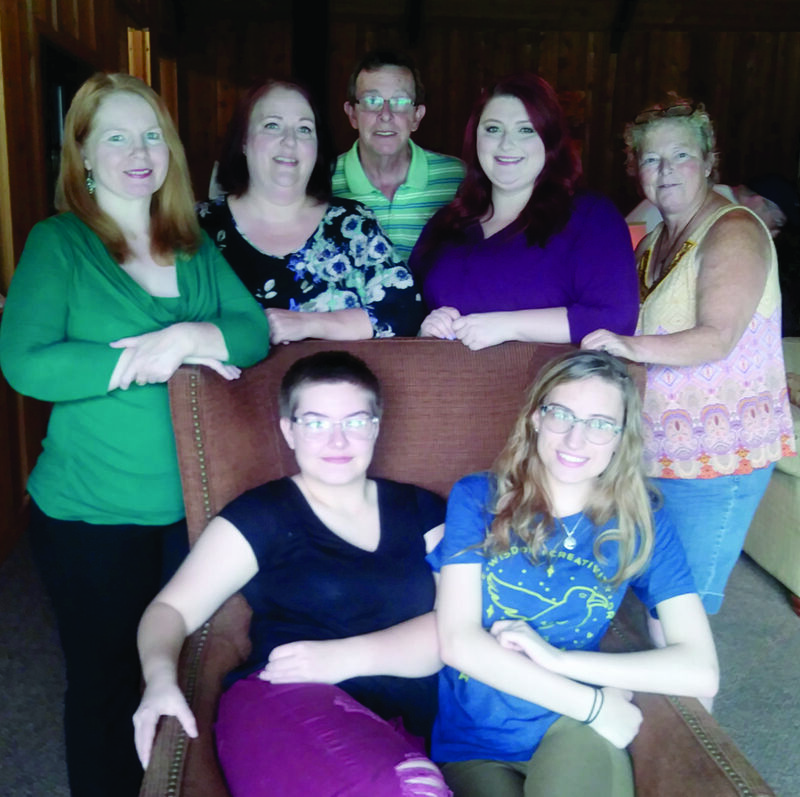 The mission of the council was to assist pregnant teens and teen mothers to stay in school and learn to care for themselves and their children. She was also the first female member of the Dalton Kiwanis Club. A lot of stuff…One thing, I know what’s important in life, and that is relationships. My friends, my girlfriend Stephanie Haynes, my son Kevin, my daughter Nicki, two grandkids (Noah and Henry), relatives, and friends are all important to me. Another thing, since Carol passed away, I don’t allow a lot of things get to me like they use to like for example politics. 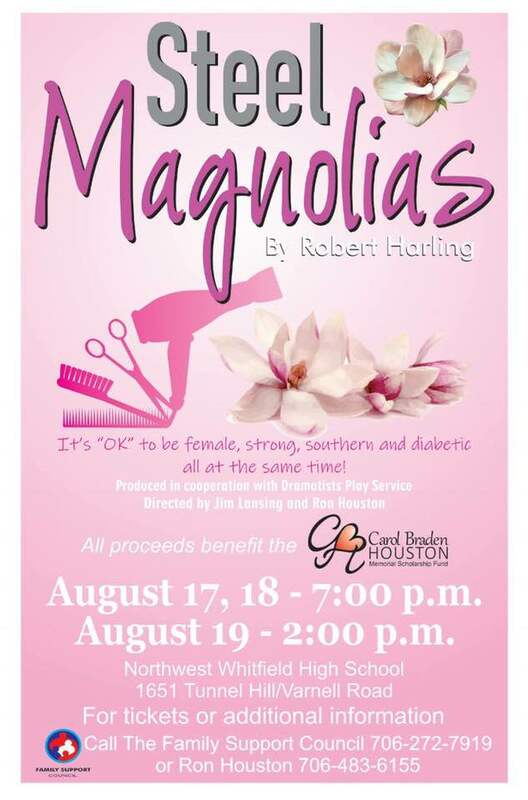 You decided to direct the play Steel Magnolias to help raise funds for Carol Braden Houston Memorial Scholarship Fund. How is the scholarship awarded? The scholarship is given out to a teen parent at end of the school year. It’s based on grade average with intention of furthering their education once they graduate. We award at the end of the school year. We’ve awarded three since it was created in 2016. What’s the area of teen parents who are awarded? 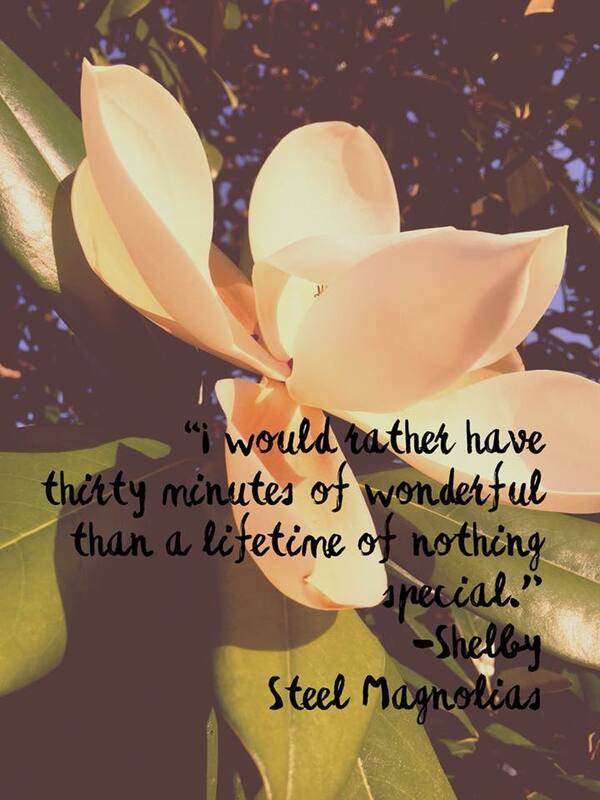 Tell me why you picked Steel Magnolias? I picked it because my late wife loved the film and identified with Shelby because she was also a diabetic. 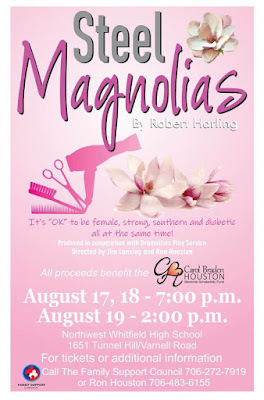 On the poster for the play is: “it’s ok to be a female, strong, diabetic and southern." All of the characters all have one element that I can identify with Carol. When are the performance dates? The play will be performed at Northwest Whitfield High School on Friday, August 17, Saturday, August 18, and Sunday, August 19 at 2PM. Friday and Saturday will be at 7PM. One that hits home is when Shelby has her insulin reaction. Another favorite scene is in the last scene. When the ladies are consoling M’Lynn and also when Clairee grabs Ouiser and says “Hit her”. They end up laughing and realize that they can still laugh in spite of their sorrow. The ladies remind of my Grief Support group by banding together, laughing, crying, and sometimes evening having an argument. I’m a feminist. I believe in women’s rights. I like to observe people and imagine what their life would be like, you know to create a story about them. I like to do impressions, but I’m not good at it. Painting and reading are a couple of my hobbies. Some of my favorite books are by Stephen King, and my favorite book is “To Kill a Mockingbird” I enjoy biographies as well. I also enjoy acting, and Carol encouraged me to act in a play in 2002. I’ve never done that before at DLT, and it was called Harvey. I played the lead. I love Jimmy Stewart movies. I also enjoy talking to people and get to know them and some of their story. One person is Jimmy Carter because he knew how to admit mistakes, and he was honest. He talked about his faith and did something with his faith as well. He admitted he wasn’t perfect. He keeps it real. I admire him a lot, and we happen to share the same birthday October 1st. Was there a particular actor or film that inspired you to act? Jimmy Stewart... I wanted to get involved with theatre because I did enjoy attending the shows. I like the challenge of it to get a role and put a part of myself in it. I like to create a backstory for the characters I portray on stage. If there was one thing you could change in the world what that be? That everybody could have Universal Healthcare. Is there a play you would like to act in but haven’t? Yes, To Kill a Mockingbird. When you’re having a tough day, where do you go for encouragement? I pray and sometimes go for a drive. I talked to my girlfriend. I share quotes with my readers, do you have a favorite quote you would like to share? Albert Pine “What we do for ourselves dies with us. 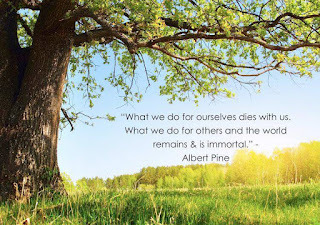 What we do for others is immortal.” I’m trying to live by that. It was also a favorite of Carol's. The cast members are Sabrina Akers as Annelle, Sierra Holcomb as Shelby, Maria Rochelle as Clairee, Amanda Havelin as M'Lynn, Jennifer Bryant as Truvy, and Vicky Quinn as Ouiser. The play is directed by Ron Houston and Jim Lansing. As always, thank you for reading and sharing my interviews!